The sleep consulting profession is a relatively new way to help overwhelmed and exhausted parents. What happens during a sleep consultation? We believe the key to successfully teaching your child to love sleep is consistency, schedule & a united front. We find that parents have an easier time staying committed when they understand why their actions make sense. During the sleep consultation meeting, we investigate your child’s current sleep situation and lifestyle. We will begin by reviewing your client history form & sleep diary together and going over some science behind the sleep: basics that include biological, neurological & behavior capacities. During the actual sleep consultation, we work with you on both nighttime and naps simultaneously, and focus on the particular areas that you are experiencing issues with. We help you help your child to learn the falling asleep process, and how respond in a way that supports your child’s needs but encourages independence. All of this is done with an emphasis on holistic ideals that are customized to your child, values and family’s lifestyle. By including you every step of the way, you become empowered- meaning when your baby experiences a setback, you’ll know exactly how to respond to get back on track. After our initial meeting, we will follow up with a detailed sleep plan, and together we will agree to a start date on when to implement the plan. We set ourselves apart by offering real-time texting support- you aren’t sure that you’re doing the right thing in the moment? Text us. Each sleep package is followed by several support phone calls/emails/texts over one week, with additional weeks available if needed. These touch bases ensure your questions are answered and allow us to tweak things if necessary so you’re comfortable and supported every step of the way. Why should we choose SATC to help us with our child's sleep issues? We are not a one-plan-fits-all company. SATC takes a holistic approach when working with our clients to ensure a sleep plan is given that fits your individual needs and lifestyle. We work with you to address the root of the sleep problem, and most often times a sleep training method is never actually used. Our passion & willingness to help those in need is what drives us when working with our clients. This passion is backed up by multiple certifications in the sleep industry: Infant sleep & Toddler sleep certification, SIDS certification, eco-friendly certification and more. We want to offer parents not only support and a customized plan, but educated guidance when it comes to your little ones. All consultations include neurological, biological, and behavioral components that are age-appropriate. SATC clients also receive private client access to areas of our website that include multiple tips & freebies. Will you spend the night and implement the plan at our house? Our goal is to help YOU help your child to learn the falling asleep process. When it comes to routine, we believe that consistency is pertinent, and we unfortunately can’t be with you at your home every day. SATC offers a real-time support option, which gives parents the option of live help when initially implementing a sleep plan. I'm SO exhausted, how early can we start? When can I begin sleep training? You can begin healthy sleep habits from birth using a rotating schedule for newborns, as included in our Newborn package here. 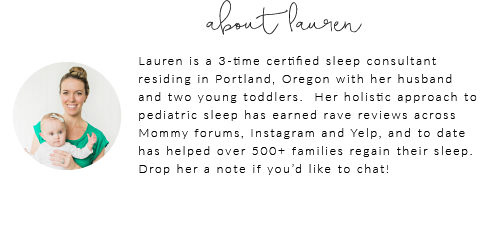 For those parents who wish to utilize our sleep training options, we ask that your child is at least 4 months old. Do you use the "Cry-it-out" method? No. The “cry-it-out” or “CIO” method receives a lot of negative attention due to the idea that a child is left alone in their crib for hours on end to cry without interaction. SATC offers a breadth of gentle sleep training methods! However, if requested, we can efficiently explore "quicker" methods for parents that need or wish to receive faster results. We do not judge or turn away any parenting style. We have a vacation coming up, is this a bad time to begin? We ask that you give yourself and your child(ren) at least 3-4 weeks at home following a sleep plan implementation due to our core values of consistency & routine. Do you guarantee your services? Will this fix my child's sleep issues forever? If you are really struggling we know it can seem as if there is no end in sight, but this really works! Our insurance, however, won’t let us guarantee our services because some of the results are out of our hands. Parents play a huge role in the success of our process. We do everything in our power to get you to your goal, but we can’t make you do anything. We understand that minor mistakes may happen along the way, but as long as you follow the customized advice we give your family and truly wish for your baby to sleep better, we will assist you and your child get the sleep you all need. If you still have questions regarding our services or how this could work for you and your family, contact us here or give us a call at (503) 307-1568!